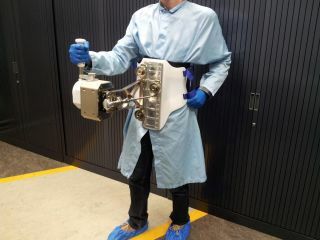 Body-mounted astronaut joystick for the Haptics-1 experiment, developed by ESA's Telerobotics and Haptics Laboratory as part of the multi-agency Meteron (Multi-Purpose End-to-End Robotic Operation Network) initiative, investigating telerobotics for space. The Haptics-1 experiment is being flown to the ISS by ATV-5 in summer 2014. This summer, astronauts on the International Space Station will test an innovative wearable joystick that may someday allow humans to remotely control robots on other worlds. The European Space Agency will launch a super-sensitive joystick, which agency officials described as "touchy-feely" in a project overview, to the space station to help engineers learn better ways to telerobotically operate a robot on a planet's surface. The astronauts will use the joystick and fill out questionnaires on its performance as part of a study on human motor control in long-term weightlessness. Because the laws of physics dictate that every action has an equal and opposite reaction, the joystick apparatus must be attached to a body harness, which in turn is bolted to the inside of the station. If the joystick wasn't secured, moving it would cause the floating astronaut to careen around the room. Like many video games, the joystick will both resist the astronaut's motions and create forces of its own, simulating the feeling of encountering objects on a moon or planet's surface. By conducting a series of tests, astronauts will help scientists understand how touch feedback feels in microgravity, and what happens to a person's motor control after prolonged periods of weightlessness. This experiment will be the first time hardware will be put into orbit from METERON (short for Multi-Purpose End-To-End Robotic Operations Network), a project operated by several countries, including the Netherlands, Germany, the United States, and Russia. METERON researches ways in which astronauts can teleoperate robotic craft from outer space. The joystick will be flown to the station aboard an unmanned Automated Transfer Vehicle, craft that the ESA uses to transport supplies, fuel, and experiments to the space station.